Are you looking for ways to supercharge your social media efforts? Have you considered native ads? Native ads not only help build your social followers and boost social engagement, they also drive high-quality consumers to your branded content. In this article you’ll discover what native ads are and how to integrate them into your social media marketing. 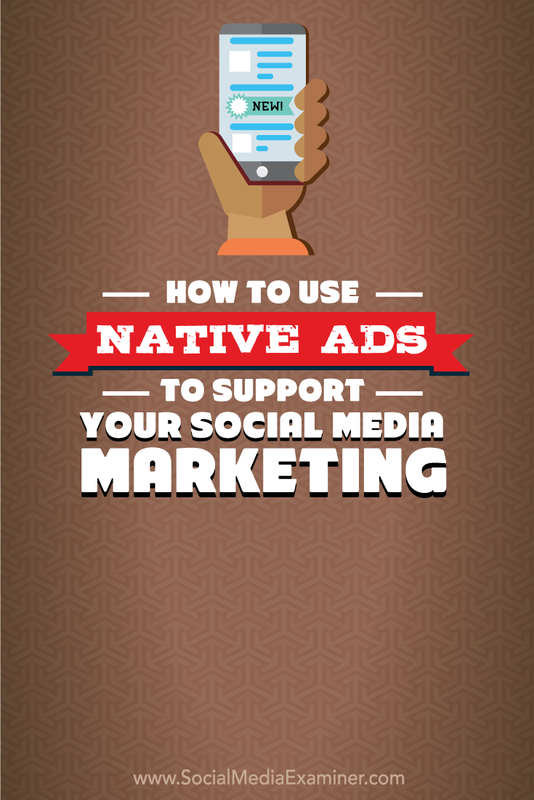 Discover how to support your social media marketing with native ads. The Content Marketing Institute defines native advertising as paid marketing that delivers useful, interesting and targeted information to your audience in a form that looks like the site’s native, or non-ad, content. The different forms that native ads can take vary greatly. They can be Google paid search results, promoted listings on Twitter, sponsored updates on LinkedIn, Facebook promoted or sponsored posts or even articles on sites like Forbes, BuzzFeed, The Huffington Post and The New York Times. Native ads can also appear as content-recommendation engines at the end of articles. This Sponsored Post from Desk.com is similar to posts seen from other LinkedIn connections. 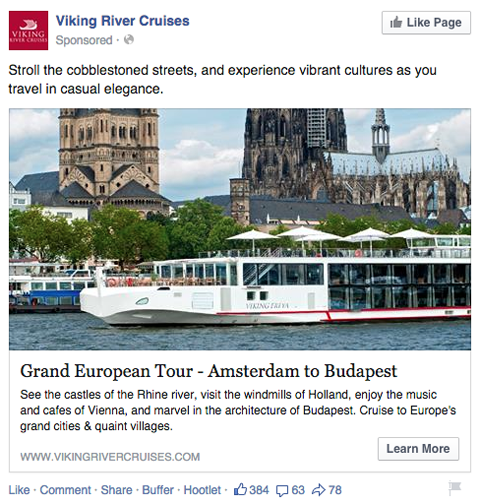 Here’s how to start integrating native ads into your social media marketing. Whatever the form, native ads offer many potential benefits to your business. Joe Pulizzi of the Content Marketing Institute says native ads can help you build brand awareness and trust, plus help bring subscribers to your content. And keep in mind that your content doesn’t always have to be new. Native ads can be a great way to attract new audiences to previously published posts. Additional benefits of native ads include SEO and social proof. Promoted posts on a strong social media site get your message in front of a larger audience and can drive traffic back to your website or blog. Native ads can be especially helpful if you have a new site and haven’t had time to build up strong SEO. Unlike other forms of digital marketing such as banner ads, native ads on social media can collect social proof such as likes, comments and shares. Facebook news feed ads resembles regular Facebook posts and attract leads by inviting viewers to ‘Learn More’. This increases the credibility of your message and viral opportunities for your brand. More awareness can equal more authority in the form of links and social signals, which can produce better rankings. 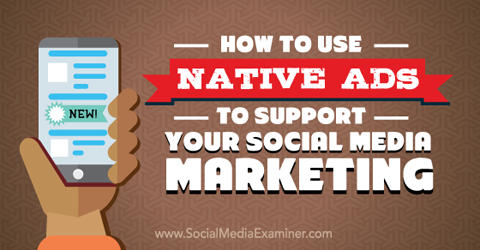 Native ads can also help you build social media audiences. A sponsored post on Facebook or Twitter can attract new users to follow you, and sponsored stories can grow likes and followers, but only when the content resonates with users. A sponsored post with little organic traction will do poorly. Promote social media content that is already popular for further exposure to a wider audience. To get the most from your native ad investment, focus on creating content that is helpful and interesting, attracts attention and provides value. And fight the urge to sell. 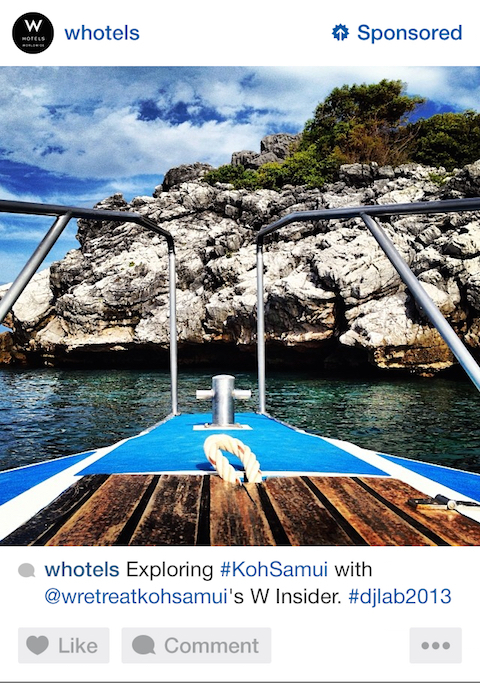 This Instagram ad uses photography instead of sales language to attract engagement. Publish the content that the ad is promoting on your own site. If your article features an infographic, chart or graph, be sure it appears on your site first with its own URL. Include a call to action that links to your blog or other social channels. Quality content is key. Go beyond marketing and break down departmental silos to leverage the expertise of others in your company. Create content your audience will find less disruptive and more engaging through segmentation with tools like geo-targeting, demographics and interests. Zoe also recommends measuring metrics beyond traditional click-through rates. Consider metrics such as brand affinity or purchase intent to determine native ad success. PR software and services company Cision suggests targeting sponsored content to Facebook users who are already customers or lookalike audiences that share characteristics with existing fans. You can also retarget native ads to people who have come to your website to view a product or service or deliver native ads based on search interest. This promoted tweet targets Twitter users with an interest in marketing. For example, if you run a restaurant, you could deliver a promoted tweet suggesting your venue to someone searching for dining recommendations. Delivering the right information to the right person can encourage first-time or repeat purchases. Cision suggests writing sponsored articles that run in relevant publications to help build awareness of products and services, lead generation and conversions. Publishing content on top media outlets like Forbes, The New York Times and BuzzFeed can deliver a lot of attention and even change perception. But it can also be expensive. If you have a smaller budget, you should consider content recommendation services. These content-discovery platforms can increase views of your content by presenting it within a large publisher’s site without directly dealing with the publishers and their budget minimums. Other native ad services like Nativo can help make native advertising easier by automating syndication of brand content into the editorial feeds of multiple publications. Content is automatically reformatted to appear native. Delivery is targeted and contextually aligned with analytics to measure results. For example, global clothing brand Reiss used Outbrain to increase traffic to the company’s blog pages. 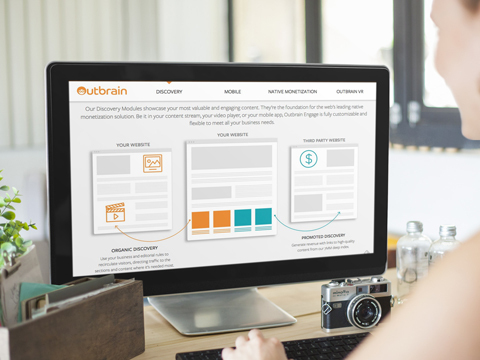 Use native advertising to drive referral traffic from third-party sites to your blog. Image: Placeit. Over a seven-month period, Reiss received over 87,000 clicks to their blog, served over 66 million impressions and saw a 36% higher average order value compared to display ads. There has been a lot of buzz about native ads, and it’s a growing marketing tactic. AdAge reports that 63% of marketers plan to increase native ad budgets in 2015, and eMarketer predicts spending on native ads will reach $4.3 billion this year, a 34% increase from 2014. What do you think? How have you used native ads to promote your business? What were your results? Please share your thoughts in the comments below. Outbrain image created with Placeit. Tips for supporting your social media marketing with native ads.